Longquan Monastery, on the outskirts of Beijing, is renowned for embracing modern digital technology in its unique approach to disseminating the Dharma. Not least among its technological innovations is Xian’er, the diminutive robotic member of the monastery’s monastic Sangha, who became an instant hit following his introduction some three years ago. * More recently, two tech companies in China have been brought on board to upgrade Xian’er with a more modern feature set. Xian’er, who stands some 60 centimeters tall and has the appearance of a small, puzzled-looking novice monk, has garnered a strong following in China. He can follow simple instructions, recite scriptures, and play Buddhist music. Xian’er can also respond to people’s emotional and spiritual questions with Buddhist wisdom, both in person and via a number of social media platforms, drawing on a database of Buddhist knowledge that is based on questions answered over many years by the abbot of Longquan Monastery, Master Xuecheng. improvements are planned to enhance his capabilities. Speaking at the 5th China Robotop and Intelligent Economic Talents Summit, an annual convention held in China’s eastern Zhejiang Province from 9–11 May, Master Xiandu said that the monastery had signed an agreement with information technology powerhouses iFlytek and Tencent to develop a more advanced third generation of Xian’er. The objective behind Longquan Monastery’s high-tech pursuits is to find innovative ways to engage with new and younger audiences. ﻿It has already started leveraging social media to promote Buddhism; the monastery’s Master Xuecheng was the first Buddhist monk in mainland China to start a blog. After recruiting programmers from several prestigious universities, the monks of Longquan have developed a digital infrastructure that includes an electronic book-lending system and mobile platforms compatible with Android and iOS devices. The temple has also produced comics, animated films, and music videos to reach out to young people. According to Master Xianfan, director of Longquan Temple’s animation center, Buddhism should be combined with modern technology in the hope that people can learn and better understand its teachings. 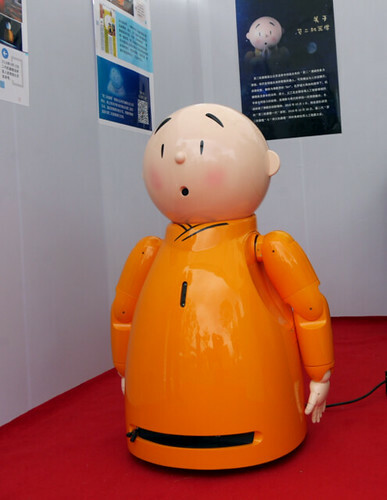 Since Xian’er’s original unveiling some three years ago, the little Buddhist robot has traveled across China to attend numerous events, including the Guangzhou International Animation Festival, the Xiamen International Buddhist Show, and a robotics conference in Beijing. To date, Xian’er has more 1.37 million fans, and conducts daily online text and voice exchanges with some 100,000 people in Chinese and English. The robo-monk has also appeared as the protagonist of his own animated cartoon series, Trouble, You Seek for Yourself, created by the monks and volunteers of Longquan Comic and Animation Group, in which the hero dispenses nuggets of Buddhist wisdom in an accessible manner. Located at the foot of the Phoenix Ridge mountain range on the western outskirts of Beijing, Longquan Monastery was founded in 957, during the Liao Dynasty (907–1125). Having been damaged, renovated, left to ruin, and revived on numerous occasions over its long and turbulent history, Longquan Monastery once again faded into obscurity following the Second Sino-Japanese War (1937–45) and during China’s Cultural Revolution, when Buddhists were actively persecuted and temples across the country were destroyed. It wasn’t until April 2005, that the temple once again restored to life and reopened for Buddhist services.